Even though it's a prequel, the Solo film directed by Ron Howard, made plenty of call backs and references to the other films in the Star Wars franchise. Here's the list of call backs and references to the other films. Did you notice the dice hanging in Han's land speeder? They are the same ones that make it on to the Falcon. They become a minor plot point in The Last Jedi and can be seen in a deleted scene from The Force Awakens. Qi'ra later gives them back to Han. After knocking the chasing TIE fighter out of the sky with Falcon, Han says to his fellow companions, "I thought we were in trouble there for just a second but it's fine, we're fine". 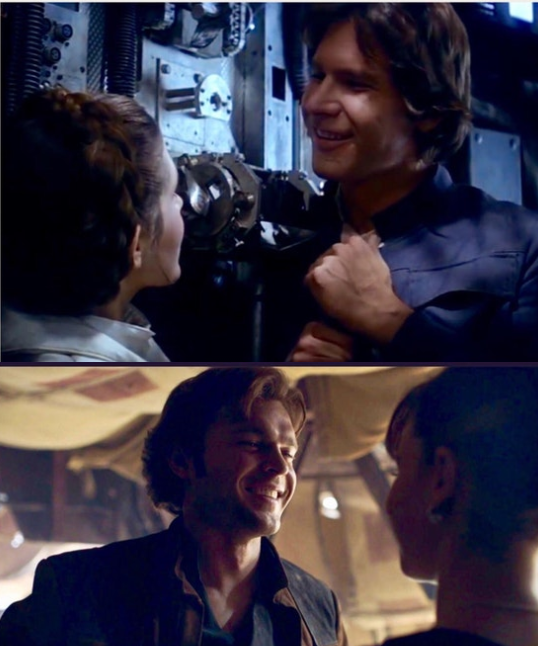 This is a call back to when Han has a conversation via a comm channel in the Prisoner Block and he say's "we're fine everything's fine how are you" which then led to the great Han Solo quote, "it was a boring conversation anyway!" Edit: This was not actually in the movie but the trailer. 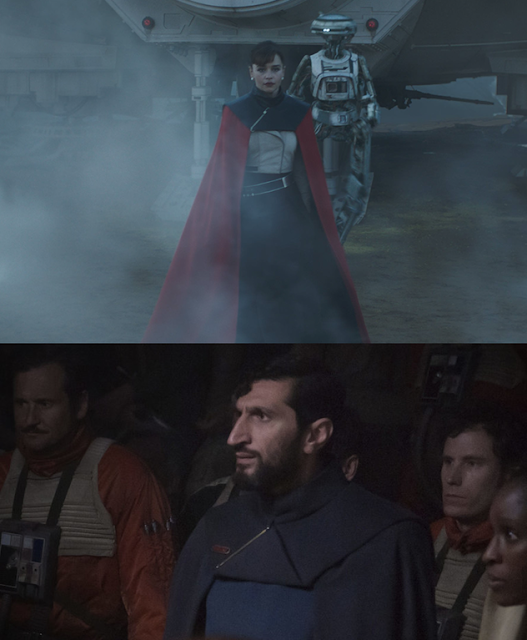 Qi'ra's red cape design style has been seen before - a certain person who was hesitant to take on the Empire in Rogue One... Vasp Vaspar. Heck, the cape could have been made for Rogue One and recycled into the Solo movie. Han says he has a 'good feeling about this', a twist on the classic 'bad feeling' expression. The "Punch it" quote (or Push it as some trailers had it) is a classic reference to the famous line. When Han says "Watch this' to Kira as he attempts to maneuver through a tight spot and fails, its a reference to Empire when Han attempts to flee the Imperials in the Falcon and he says the same line. We finally get to see Chewbacca rip someone's arms off in the mine elevator on Kessel (the deleted scene in The Force Awakens does not count). This is the kind of skill Han warned Chewie had in ANH. Han pretending to use a thermal detonator in front of Proxima is a call back to when Leia does it in front of Jabba the Hutt in Jedi. Han claims in front of Lando that his ship is a VCX-100. This a reference to the freighter flown in the Rebels television show. The Zan sisters are mentioned in the book Shadows of the Empire. Speaking of Empire, the bounty hunter Bossk is mused as a possible fit for Beckett's team. There's a 'Two Tubes' alien from Rogue One that is a part of Enfys Nest's marauder gang. Han shoots Beckett first, the same as he shot 'poor' Greedo first in A New Hope. When Han and Lando hug at the end, it reverses their hug when they first meet in The Empire Strikes Back, this time Han is the aggressor. Tobias Becket is confirmed to be the killer of Aurra Sing. She was spied in The Phantom Menace. Lando deliberately states Han as Harn thus establish why Billy Dee did that in Empire. It kind of fixes the mispronunciation mistake he made. Chewie plays space chess on the Falcon with Beckett, a call back to ANH and The Force Awakens. Qi’ra was a student of the fictional martial art called Teras Kasi. The name "Teras Kasi" is a direct reference to the Star Wars-themed fighting game on the PlayStation, called Star Wars: Masters of Teras Kasi. We can probably thank Jon Kasdan for that one. Warrick Davis plays his millionth cameo in a Star Wars film. This time he's a part of the Enfys Nest gang. And given they use his natural face, it would seem he's playing Weasel who was first spied in The Phantom Menace as part of the pod racing scenes. When Han is stuck in the mud when he fights Chewie, his pose is the same as that when he was frozen in Carbonite in TESB. When Lando says to Han, "I hate you", he replies with the iconic line from TESB, "I know". In The Empire Strikes back Han and Lando are taking about the Millenium Falcon and Han says "you lost her to me, fair and square". In this film, Lando is a card cheat, and Han takes advantage of that to win the last game by removing Lando's cheat card from the game, thus making it, fair and square. Lando talks about how he had "alluvial dampers" installed on the Falcon. Han references these in The Empire Strikes Back when he suggests Chewie checks on them. Jabba the Hutt is referred to as a gangster putting together a crew. Darth Maul's cameo is as obvious a cameo as anything! When Chewbacca is offered as a slave on Kessel, it's a subterfuge - Han uses the same trick with Chewie on the Death Star in ANH. The smuggling compartments are used to store the fuel - these of course a used in ANH and The Force Awakens. Lando does a two fingered salute - just as he does before the Battle for Endor in Jedi. The helmet Beckett wears as he enters the Spice Mine as Kira's bodyguard is the same that which Lando wears in Return of the Jedi at Jabba's Palace. A Stormtrooper says "Move along, move along" - the same line that is said to Luke and Obi-Wan Kenobi in A New Hope.